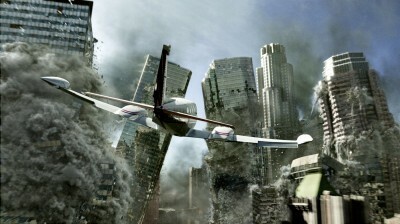 In the high stakes Hollywood blockbuster poker game, Roland Emmerich is going all in with "2012." A disaster movie to end all disaster movies, "2012" is an enormous moviegoing event guaranteed to make eyes bleed and ears burst with its sheer scale and thundering execution. To bend the dictionary a little, it's positively ginormous. "2012" is also disturbingly repetitive, obnoxiously noisy, and almost pornographic in length. Instead of providing a comforting bowl of melted apocalyptic cheese, Emmerich wants to beat the living hell out of his audience instead, staging doom after doom, death after death, until it reaches a nauseating spin of sensorial overload. It's cinematic waterboarding and there was more than one occasion during the film when I was convinced it was never going to end. As the Mayan calendar foretold, Earth is ready to restructure itself in the year 2012, and there's no possible way to stop it. For government scientist Adrian (Chiwetel Ejiofor), semi-early detection has helped to prepare the leaders of the world for the worst, with billions spent to construct colossal arks to help preserve humanity's finest minds. 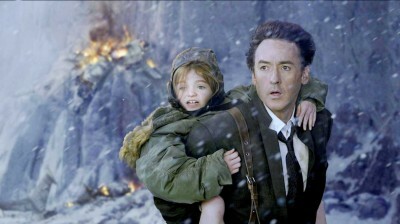 In Los Angeles, Jackson (John Cusack) is a struggling divorced dad hoping to connect with his estranged kids on a camping trip to Yellowstone. En route, Jackson finds ecological devastation and the radio rants of conspiracy nut Charlie (Woody Harrelson), who warns of the impending 2012 disaster, much to Jackson's disbelief. Once the Earth's crust commences its destructive shift, Jackson races back to California to rescue his family (including Amanda Peet) as the continents crumble, burst, and submerge during the planet's ferocious final act. Roland Emmerich has a wealth of experience in the field of disaster cinema. In fact, it's pretty much all the man has worked on during his erratic career. While hitting highlights like the rousing "Independence Day," Emmerich is also responsible for cringers such as "The Day After Tomorrow" and 1998's "Godzilla." "2012" is a brown cloud floating somewhere between the two extremes, often uncomfortably so. While the creative electricity is obviously flowing through the filmmaker's system with "2012," Emmerich's notoriously questionable taste is on vivid display throughout this gaudy epic, emphasizing a director who's lost his youthful wonder, replacing nimble silver screen spectacle with severe punishment. "2012" is 158 minutes long. This is not an unheard of running time for the genre, but for such a snarling, aggressive film, 158 minutes feels like an eternity. Granted, the picture's early scenes are comfortable enough, happily building the suspense as the ground splits open, scientists stare feverishly at apocalyptic forecasts, and Jackson slowly grasps the frightening end of the world scenario standing before him. Action is always a priority for Emmerich, and "2012" submits a carefree mood of near misses and, of course, cataclysmic events that tear a good section of the world (notably Los Angeles and Washington D.C.) to pieces. These are the money shots and they're sold impeccably by the special effects team, who manage well under Emmerich's patient eye, delivering vast, extended statements of doom, marked by outstanding detail and twisted imagination (however, the greenscreen work is the worst I've seen since "A Sound of Thunder"). With Cusack around, the nightmare scenario is lifted some: the actor leans into the outrageousness agreeably, though I'm sure Emmerich didn't even notice. There's Danny Glover as the President of the United States, a Russian billionaire with a Paris Hiltonesque girlfriend, Tom McCarthy playing Jackson's domestic rival, kids with urinary incontinence problems, Oliver Platt as the sniveling government stooge, improbable cell phone reception, car-fu, airplane gymnastics, bad Arnold Schwarzenegger vocal imitators, and surveillance cameras with unlikely range. There's a whole lotta silly going on in "2012," and while camp is always repellent, Emmerich could've made the entire experience more agreeable by keeping the mood fresh and playful. 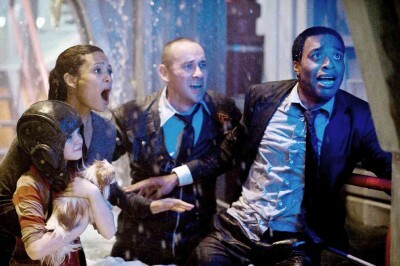 Instead, "2012" becomes quite grave, taking its nonsense seriously after a frothy start, alternating between scenes of unspeakable annihilation and absurd intimacy, where the characters take a smoke break from the end of the world to worry about parental responsibility or romantic partners. The female characters even bond over breast implant talk. Yeesh. Volleying back and forth between agony and melodrama tuckers out "2012" quickly, forcing Emmerich to dial up the noise even louder to keep attention glued to the screen. Is there any reason to care about these characters? Absolutely not. They're pathetic Irwin Allen stand-ins saddled with threadbare motivation and abysmal dialogue, standing in a single file line on their way to the CG-amped slaughterhouse, filling Emmerich's screenwriting 101 cliché requirements to help beef up the mayhem. It's bad enough to be subjected to 158 minutes of earsplitting chaos, but to witness a clownish director making a pass at poignancy is excruciating to behold. The more "2012" attempts to brazenly manipulate, the more it turns to stone. Some might make the argument that Emmerich is in on the joke. That "2012" is purposely engorged to best extract the finest blockbuster bait. I'm not convinced such a plan was in place. The picture is too oblivious and too self-congratulatory for such a master stroke of wit, and, outside of an asinine doggie rescue scene, I'm positive Emmerich believes in every single moment of this film. Someone has to. There's an idiotic audacity to "2012" that might appeal to certain audiences out there craving a silver screen circus. For the gut-level awe of it all, "2012" will provide the appropriate chills as Earth succumbs to its fiery, waterlogged destiny. Just don't sit there expecting an invitation from Emmerich to join the fun. He's only here to beat you senseless, not entertain. It'll hurt more if you squirm. Buy tickets to "2012" now!